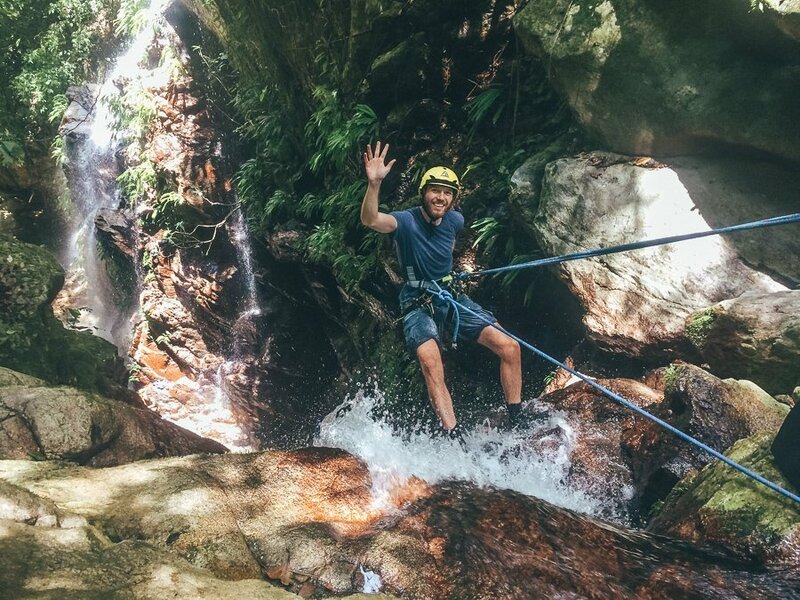 During our week in the Pico Bonito National Park we were looking for some cool activities to do. Because this area is known for the fun rafting tours, we went on a full day raft excursion. And we did a beautiful hike through the jungle. But the excursion that we loved the most was the one were we abseiled from waterfalls in the middle of the jungle. It was so much fun and I really recommend this activity if you’re going to Honduras. In this article I’ll tell you everything about it, including some great pics. The day starts by fitting all the material. Abseiling is not without risks so it’s very important that you fit the materials beforehand and know how to use this. This takes about fifteen minutes before you start the adventure. 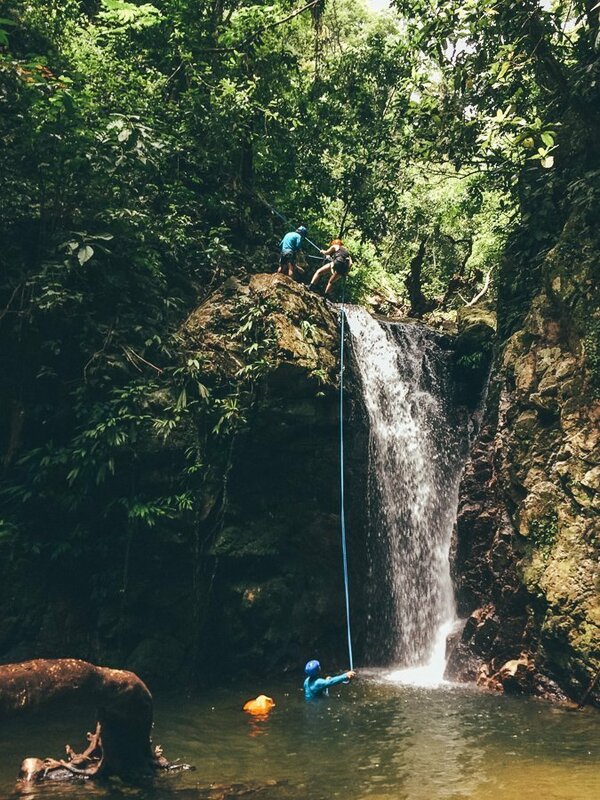 First you need to abseil from a small waterfall, just to practice and get used to this activity. You will learn where to put your feet and what you need to do with your hands. It’s a nice practice to get to know these waterfalls. But then it’s time for the real work. You need to hike up to the biggest waterfall first, what takes about 30 minutes. When you reach the top the view is really amazing. You’re on the top of a 25 meters high waterfall and right in front of you there are two more waterfalls, which are so beautiful. It actually looks surreal, like you’re in a fairytale. Anyway, it’s time to get serious now. You have to go over the edge, which is very exciting. And before you even know it, you’re dangling 25 meters above the ground while you’re surrounded by water that thunders into the natural pool with high speed. Scary? No, absolutely not. Just fun! Besides, you’re so focussed on getting down so you don’t even have time to be scared. The first few minutes are very easy, but then the water is getting more powerful so it’s hard to keep your feet at the right place. At one moment the water was everywhere, even in my eyes and in my mouth. So it was quite hard to breathe or see something. Although I couldn’t breathe normally and I couldn’t see anything while I was hanging at a waterfall in the middle of nowhere, I still had a blast. You have to get yourself down, going left and right, and after some time you can put your feet on the ground again. Congrats, you’ve made it! But that’s not the only activity what this day is about. 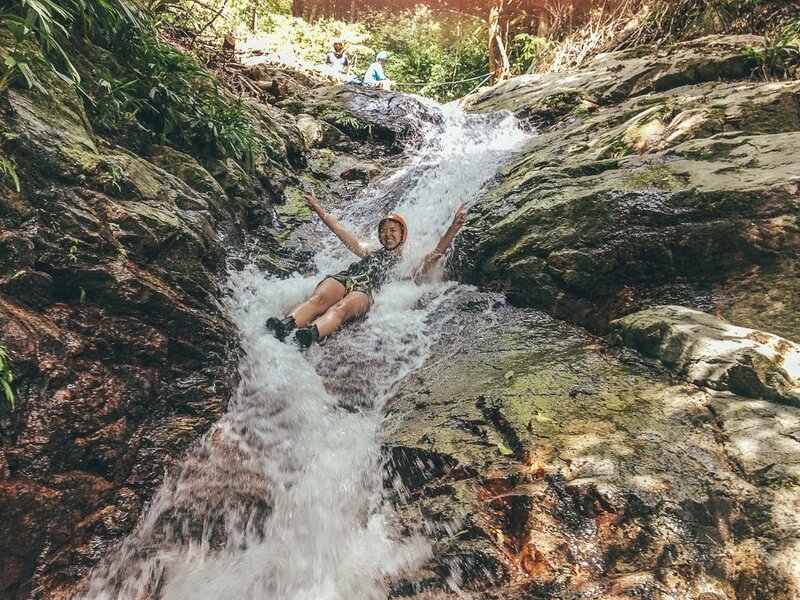 After you’ve survived the mother of waterfalls, you need to swim through the natural pools, jump from high rocks and slide down into the water. You need to abseil at some parts, other parts are all about swimming, hiking and jumping. This was really cool, because there was so much variety. And the best part about this? You won’t come across anyone. But I did saw a footprint of a jaguar! This guy was at this exact point just a few hours before us. How cool is that?! Every lodge in the national park has its own activities and this one is offered by the Las Cascadas Lodge. The name says enough, because ‘Las Cascadas’ means ‘the waterfalls’. You can imagine why. They wanted to create a fun activity that you can do all year round, so that’s why they came up with this excursion. They own a huuuuge property so all the waterfalls in this area are private property. And that’s so cool! This is why you won’t see anyone for hours, besides the guides. The area is stunning and you have the best views while doing this activity. And besides this fun excursion, I can definitely recommend staying at the lodge for at least one night. I didn’t stay there myself but they showed me around and the rooms were beautiful. But the most amazing thing about the rooms is the view you have while you’re laying in bed. Right in front of you there’s this gorgeous waterfall, how amazing is that? And when I was walking through the property of the lodge, it felt like I was the only person in the world. It’s so peaceful and quiet! One night costs you 450 dollars, but everything is included. And the food at the other lodges is not cheap either. So if you don’t mind spending a bit more, I recommend to stay here for one night or longer. Is it a bit too expensive for you? No worries, you can also stay at the Omega Tours Ecolodge or the Villas Pico Bonito next door. The first one is so beautiful, with great food, lovely rooms and fun activities. The second one has a wonderful location, right in front of the wild river. One thing is for sure: you won’t get bored! 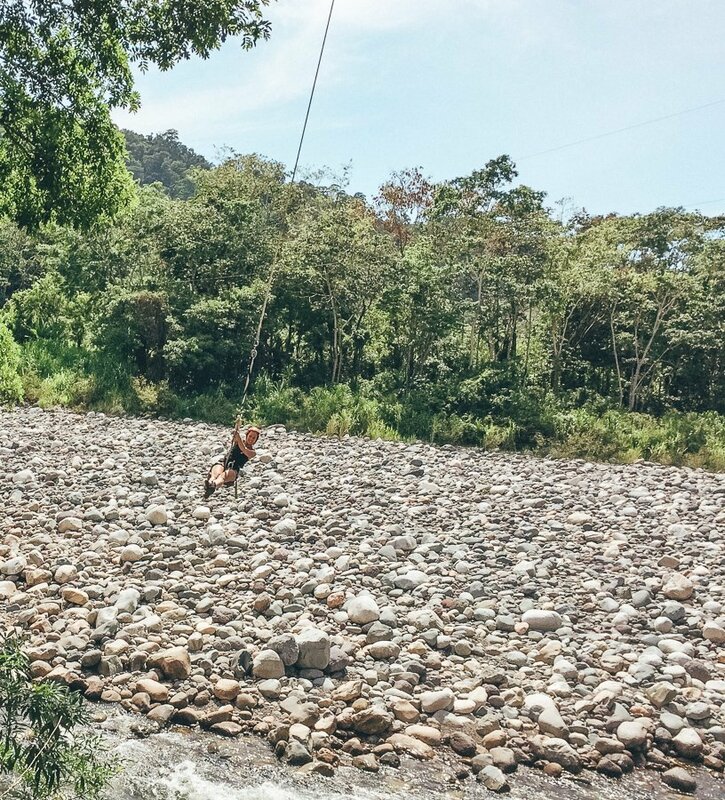 Take a look at the website of Las Cascadas Lodge to read more about this awesome adventure!